Maldives Police Service has said that protest rallies would not be allowed to continue after 10:30 p.m. effective from tonight. Speaking at a police press conference at Iskandharu Koshi today, Spokesperson of the police, Superintendent Ahmed Shifan said that after 10:30 p.m., no political party would be given the opportunity to hold rallies. Superintendent Shifan said that they have been receiving non-stop complaints regarding the unrest being created at every night as of late. He said that a number of dangerous things are happening at the rallies recently including the use of masks to hide faces when engaging illegal activity. Police said that massive damages are being caused to property and requested support in the police efforts to stop such actions. 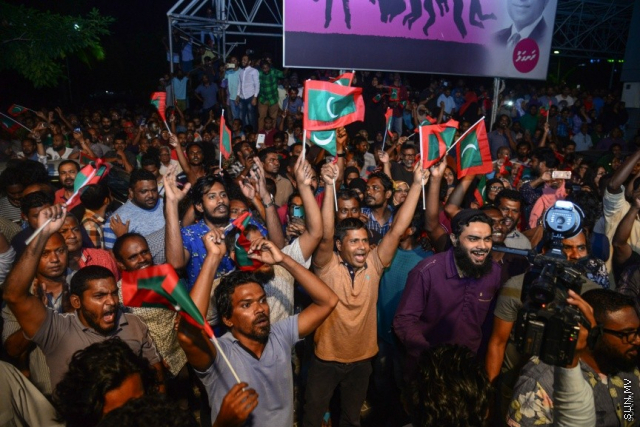 While the police has said that no political opinion would be partial to exception to the rule, PPM has said that starting tonight, they would not be hosting any political events after 10:30 p.m.